September 3: After a rather humid night, we woke up to a nice morning – the sun was shining, large patches of blue sky were visible and even though clouds were many, they were mostly white and friendly-looking. 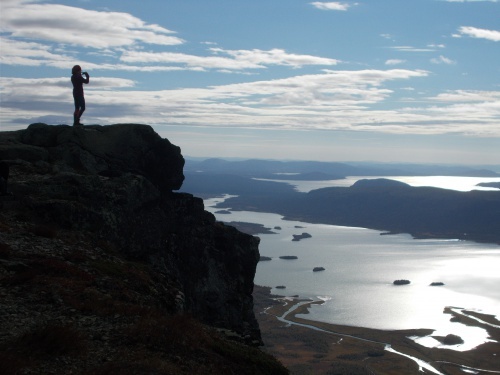 A good morning for the detour we planned–to the top of the famous Skierfe mountain! The top of that cliff on the right side of the photo... that's Skierfe and our main goal for the day! We ate breakfast, broke down camp and hit the side trail leading to Skierfe around 7:30. 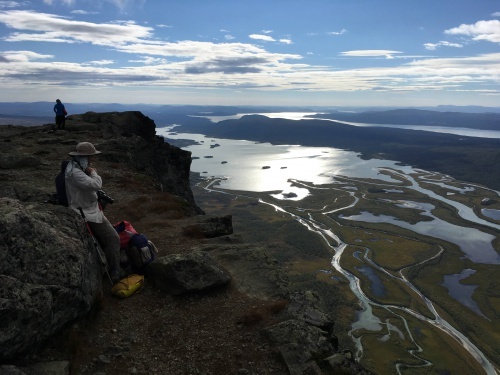 We had 8 km (5 miles) to reach the top, then we would need to backtrack–we were going to return to the Kungsleden at the very same spot where we camped. Initially I had been planning to leave all my gear at the campsite and hike to Skierfe lightweight but Ryan talked me out of this idea. He said the campsite was too well established, so there was a real risk that rodents could make damage to the gear we would leave behind–and certainly to any food we would leave behind. Too bad because food made up the heaviest part of my pack’s content and I would be more than happy to not have to carry it. Now, too concerned about critters just waiting out there in the bushes, willing to grab every opportunity to feast on careless hiker’s resupplies, I was reluctantly carrying my fully loaded pack. 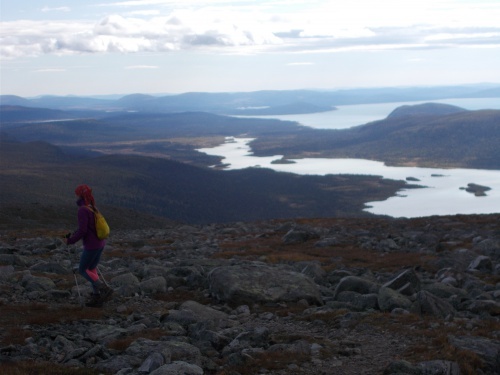 The first few kilometers of the Skierfe detour were flat and easy to hike. 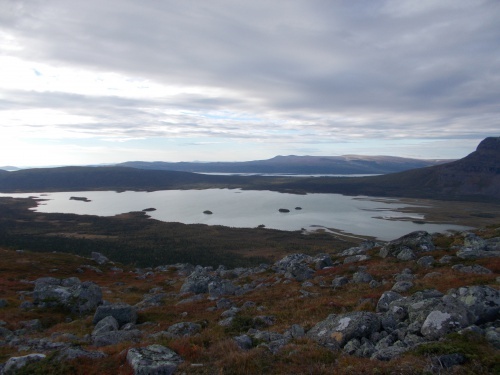 We were walking along the ridge overlooking Lake Laitaure that we had crossed by row boat the day before. On the far end of the lake we could see the place where we had started our boat crossing. Ryan kept on looking back in that direction, hoping he would see some hikers trying to row across the lake. He thought it would be amusing to watch the row boat struggle with wind and turn around in circles just like we had done the previous afternoon. No boat was visible, though. After a while of hiking we noticed two tents pitched not far from the trail. Outside one of them we saw Claudia. The other tent must have belonged to the couple from Czech Republic who we had first met during the motorboat ride to Kvikkjokk and who we had seen passing our campsite the previous evening. 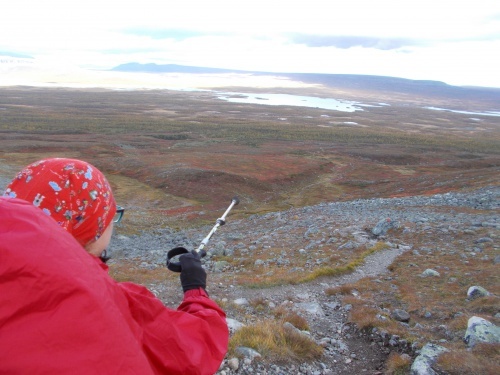 We waved at Claudia and congratulated her on the great campsite – the views she had were stunning, with Lake Laitaure down below and Skierfe ahead. Claudia was just having her breakfast and told us she was going to start hiking in about a half hour. She was going to leave her tent pitched where it was and hike lightweight, carrying only the things she needed for a few hours’ hike, such as snacks and a camera. I felt so jealous. In the meantime the trail conditions deteriorated and we entered a wet and muddy area. We were doing our best to not get our feet too dirty and too wet. That required getting off the trail and bushwhacking around large puddles. 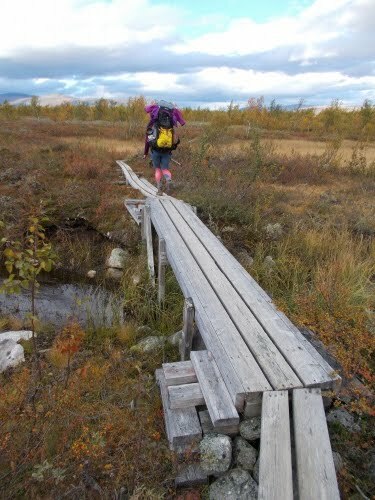 We could tell we weren’t the first ones to do that–there was a clear network of paths stamped out through the vegetation by previous hikers who had been maneuvering around the most muddy spots and the deepest puddles. After the muddy area the path started going up. With every step up I my pack seemed to be getting heavier and heavier. I couldn’t stop thinking about Claudia who was going to leave all her gear in her tent. A short while later the Czech couple passed us and neither of them was carrying a pack. I was really regretting not having left my pack at the campsite. I felt like a looser carrying many kilograms of dead weight on my back while other, smarter people enjoyed their lightweight day hike. I started making loud complaints about the situation. That got on Ryan’s nerves. He first told me to pour out the 2 liters of water I was carrying. The previous evening we filled up with extra water, knowing from our maps that there weren’t any water sources around our intended campsite and along most of the way to Skierfe. We learned from another hiker who had gone up the day before, however, that there was a small stream available just before the last assault to the top where we could pick up more water, so the extra water was no longer necessary. That wasn’t enough, though. My pack still felt terribly, terribly heavy and I kept on complaining, pushing the limits of Ryan’s patience even further. Finally, Ryan had enough and suggested in a very nice and friendly way that I better leave my pack hidden somewhere behind a rock and continue hiking to the top of Skierfe without it. Now we were far away from any established campsites, so rodents shouldn’t be a big problem and there weren’t many hikers on this trail, so people shouldn’t be a problem either. I hesitated for a moment, but the idea of lightweight hiking was very appealing, so I did as Ryan suggested and left my pack in a place I considered safe enough. Ryan, however, preferred to keep on carrying his full pack. It felt so good to not have those kilograms on my shoulders! I almost felt as if I grew wings, as if something was pushing me up and ahead! I could go fast! I could go far! I was jumping happily from rock to rock, looking back at Ryan hauling behind me, trying not to outrun him too much. We reached the top of Skierfe at around 10:15. The last stretch was steep and rocky, without clearly marked trail. It was just going up, towards the top. The couple from Czech Republic arrived at the top mere minutes before us. Claudia had been there already for a while, sitting and enjoying the views. Apart from the five of us, there weren’t any other people around. 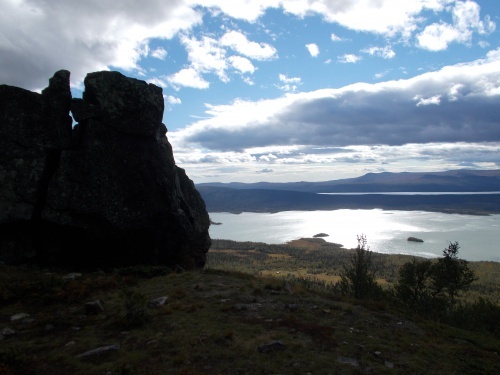 The view from the top of Skierfe (1,179 m/3,868 ft) was spectacular! 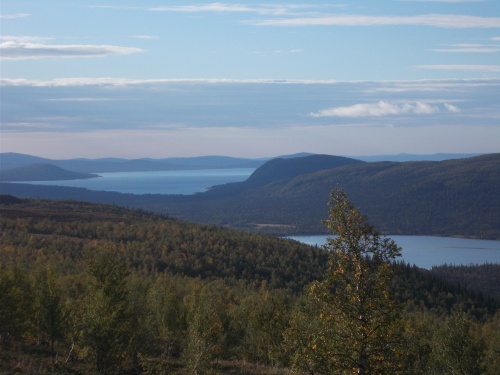 According to our guidebook, it was supposed to be the most beautiful view in Sweden–and this might as well be true. The western wall of Skierfe is practically vertical. It overlooks the Rapa River flowing into Lake Laitaure, forming the truly scenic Laitaure Delta. Looking down we could see a network of rivers and lakes. 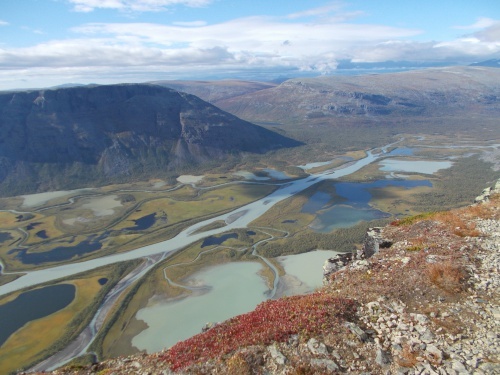 The most interesting thing about them was that some of them had the beautiful turquoise color of glacial flour while others were filled with dark blue water. Trees were growing only along the riverbanks and on the slopes of mountains while most of the valley bottom was covered with yellow-green wet-looking meadows. 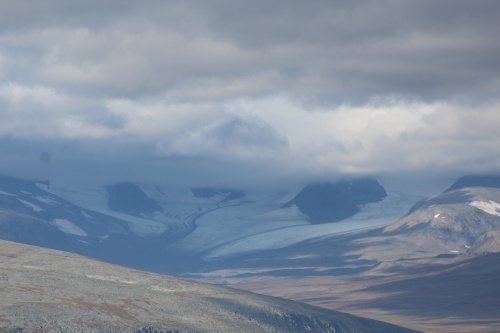 Further in the distance there were granite rocks and mountaintops covered with snowcaps, and enormous glacier tongues flowing between them. I felt lucky we got to reach Skierfe on a relatively nice morning, with enough direct sunlight to make all the colors and shades visible. Yet, there were enough clouds on the sky to make photographing the panorama difficult–either the lighting was changing too quickly from very bright to very dark or only some patches of the land were lit by sunrise while others remained in the dark shadow casted by thick and heavy clouds. We stayed on the top of Skierfe for the better part of an hour. Enough time to admire the views (or—as I sometimes like to say— “let our eyes graze on all the beautiful views”), take photos and have snacks. I would have loved to hang out there longer, but it was getting cold and windy. We needed to get moving in order to warm our bodies up and get down to lower elevations and less exposed terrain to escape the wind. The Czech couple left Skierfe maybe a quarter of an hour before us and Claudia intended to still stay there for a while. Later she would return to her camp where she intended to spend the second night. Views from the top of Skierfe were absolutely jaw-droppingly beautiful! 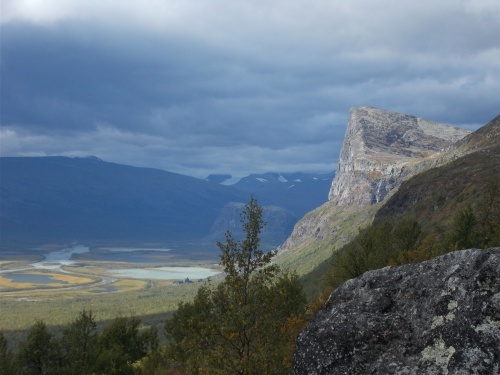 The hike back to the Kungsleden was rather uneventful. I managed to retrieve my pack from the place where I had left it without any problems. No damage done to my gear! Whew! Putting the large and heavy pack back on my shoulders after hiking for several kilometers with only a small day pack wasn’t fun, though. Earlier, when I had switched from the heavy load to the light one I felt as if I grew wings. Now I felt quite the opposite—my pack was weighing me down. Not far from the place where I retrieved my pack, we met the Polish couple, Magda and Kamil. 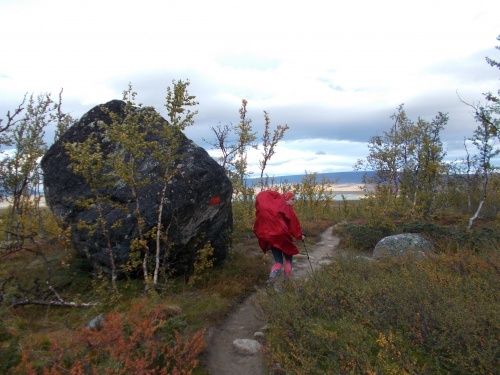 They were going towards Skierfe, of course not wearing their heavy packs which they had hidden among rocks and bushes further down. We chatted for a while, asking each other about further hiking and camping plans. Then we continued our separate ways. 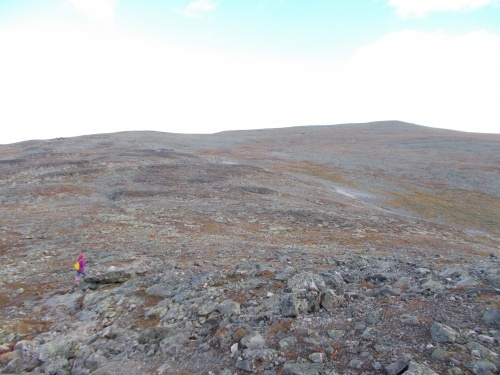 Around 13:15 we arrived at the junction with the Kungsleden where we stopped for a break. Ryan spread his tarp out on the ground to let it dry in the sun. We pulled the map to locate water sources, potential campsites and plan the rest of the day. 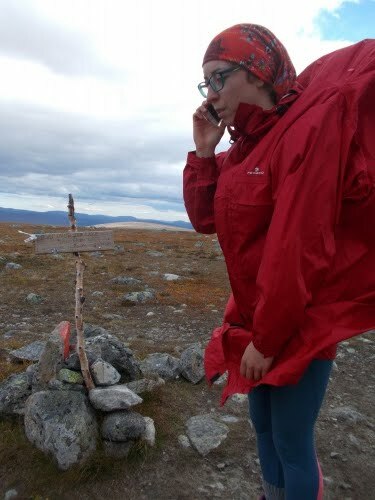 Originally, we had thought of spending the second night near the junction with the path to Skierfe, after completing the 16 km (10 miles) long detour to the top of the mountain and back. 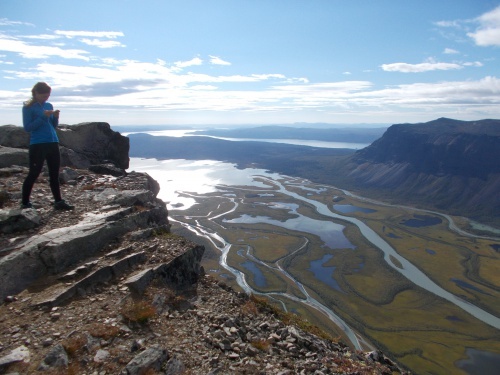 Now, however, we felt like continuing the hike —we didn’t feel tired (the detour turned out to be a relatively easy hike), it was still early in the day and according to our map the next water source and—thus the next possible campsite—was just 4 km (2.5 miles) ahead. We decided to go this extra distance. As we were sitting near the trail junction making our plans, the Czech couple passed us. 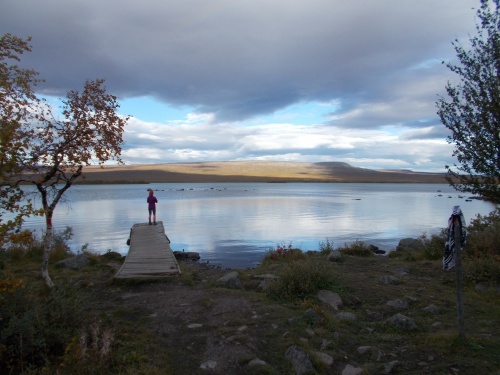 They intended to hike as far as the lakes Gåbddåjávree and Gasskajávrre, which they wanted to cross by motorboat that evening. 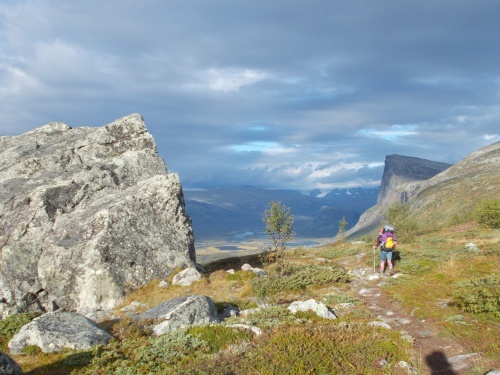 They were on a tight schedule, rushing to complete the Kungsleden before they had to fly back to Czech Republic. That meant that they were going to do longer days than Ryan and I and we wouldn’t see each other anymore. We wished each other happy trails and the Czech couple left. Eventually, Ryan and I had rested enough, and we were ready to hit the trail too. In the meantime, the weather started changing for worse. Until now, it has been rather sunny, with some friendly-looking clouds covering the sky, now the clouds were becoming more ominous. They covered the entire sky. 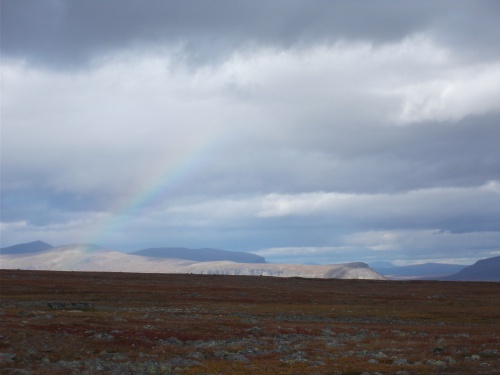 Rain was imminent—in fact, looking towards Skierfe, we saw a sheet of rain falling down. How lucky we were to have completed out detour while the weather was still good! The trail continued going slightly up. Far in the distance behind us, we could still see Lake Laitaure where at some point Ryan noticed a small dot moving slowly between little islands. This must have been a row boat! Apparently, some hikers were trying to cross the lake and from what we could see they were doing good—going forward, rather straight. 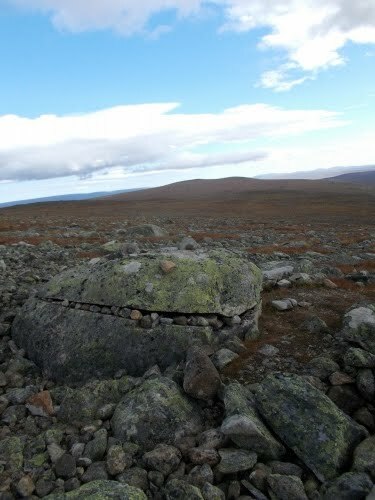 After about an hour of hiking, we reached the top of the hill where a notice board was placed with information about the next boat crossing on Gåbddåjávree and Gasskajávrre Lakes. According to the notice board, we were less than 2 hours walking from the shore of the lakes and if we wanted to cross them by motorboat, that very spot was the only place where we could receive a signal from a mobile network and make a phone call to arrange the transportation. It was also possible to cross those lakes by rowboat. However, Ryan and I had already decided that this time we would arrange a motorboat. 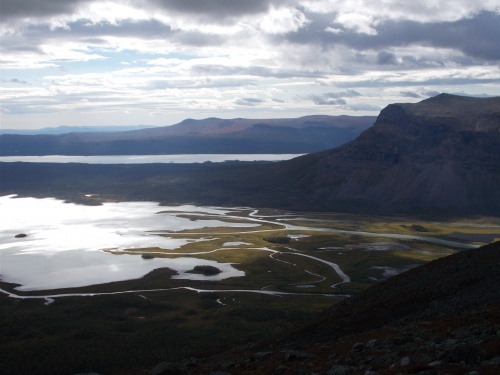 That next lake crossing was 4 km (2.5 miles) long—longer than our previous crossing on Lake Laitaure. Rowing across Laitaure the day before was tiring enough and took a lot of time—we did not feel like repeating the experience, especially when we had no guarantee there would be two rowboats on “our” side of the lake, which would allow us to make a single trip across the lakes. 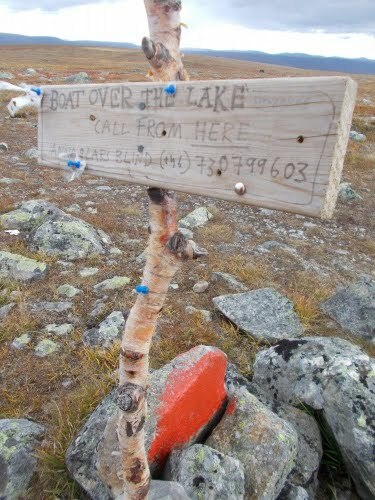 This sign marks the one place where people can get cell-phone reception to call for a motorboat at the next lake crossing a couple of hiking hours away. Two minutes later, I heard my phone ringing. A woman confirmed that she will pick us from the southern shore of the lakes and told us to be ready and waiting at the dock at 9:15. Karolina calls ahead to make a boat reservation. Transportation arranged, we continued hiking and searching for a good place to camp. As it turned out, that latter proved rather difficult… Going down the hill, we spotted a few nice looking campsites. Unfortunately, we couldn’t stop at any of them—we didn’t have enough water. We had to continue our hike until we reached a water source. Eventually, we reached a fast-flowing creek where we filled up our bottles and bladders with water. There were, however, no campsites near the creek as the area around was boggy and not campable. We had no choice but to push onward until we found a better place to set our camp. We kept on walking and walking across boggy meadows, not seeing any campable piece of ground. How difficult could it be to find a campsite for tonight? We had passed several of them when we didn’t have enough water on us to take us through the night, now that we had water, the terrain wasn’t suitable for camping! Eventually the boggy meadows finished and we entered a birch forest. The forest was very pretty, with all leaves golden-yellow colors. The fall had started for good in this area! Among the trees, we spotted a campsite we could claim for the night. We put our packs down and before settling for good, we scouted the terrain around—maybe we could find an even better spot. Ryan went further down the trail while I remained near our packs, keeping an eye on them. He was gone for quite a while. He returned with news: we were just about five minute walk from the shore, there were nice campsites , there was an outhouse and he met the Czech couple waiting at the dock for the motorboat. He chatted with them for a while, which was why he was gone for so long. We decided to camp by the shore, so we picked our packs and walk the last few hundred steps. The campsites were indeed nice. We picked the one closest to the shore. Within the campsite we found a little bench created from rocks and a wooden board and a fire pit. Ryan suggested that we should make a campfire, so while he got to pitching his tarp I went around collecting wood. Just as we got the fire started and were enjoying watching the flames we saw the Polish couple reaching the lake shore. Ryan went ahead and invited them to join us at the campfire, which they did for a while. They couldn’t stay for too long, though—in about ten minutes, they were expecting the motorboat. 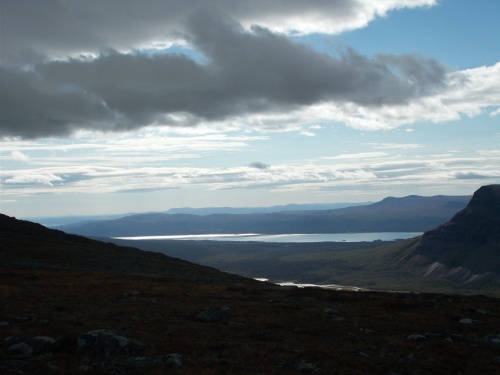 They had decided to cross the lake tonight and camp near the Sitojaure Mountain Hut on the other shore. We chatted a bit in Polish and English. Ryan practiced his Polish a bit by asking the couple where in Poland they came from. As it turned out, they lived I a city he was familiar with—Katowice. Working the campfire--our first on the trail! The Polish couple gone, Ryan and I continued to enjoy the campfire when to our surprise we heard voices coming from the direction of the lake. It looked like there were people milling around the dock. Ryan went to check this out and found a young couple from Austria who had just arrived in a motorboat, the same one which took the Polish couple to the opposite side of the lakes. The Austrians were looking for a place to camp. Ryan directed them towards free campsites and invited them to join us at the campfire once they settled down. They joined us some time later and even brought some fire wood as a contribution to keeping the fire burning. 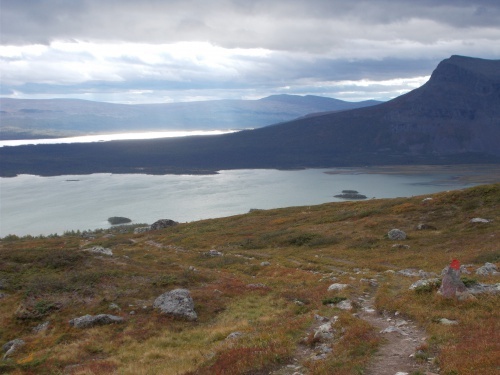 The four of us chatted for quite a while, exchanging experiences from the Kungsleden and other trails. One of the things we learned was that during the previous summer the Austrians had hiked the GR20 on Corsica – Ryan and I hiked that trail in 2015. For the young Austrians the GR20 was the first multi-day trek they had ever done and I admired them for choosing a trail with such a high level of difficulty to be their first big hiking experience. It was already quite dark when the Austrian couple retired to their tent. Ryan and I had the fire going for a little longer. It kept us warm. Finally, we got tired enough. 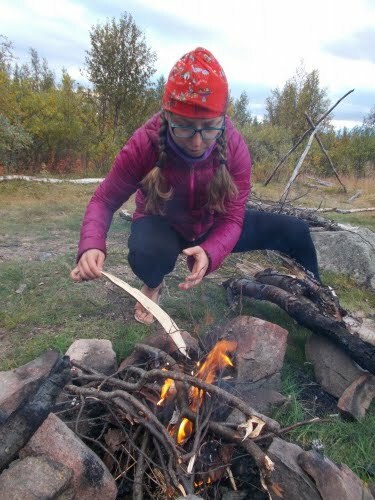 We made sure the fire was out before crawling into our sleeping bags. It had been a very enjoyable evening. 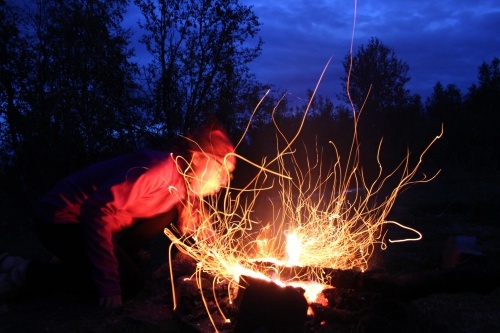 Karolina blows on the campfire sending a shower of sparks into the air! Gorgeous, gorgeous views from Skierfe! The turquoise lakes are filled with glacial flour from the distant glaciers. 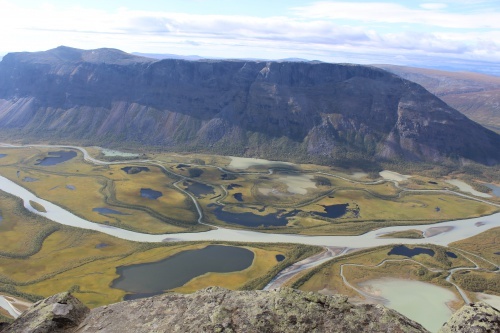 Those dark blue lakes don't have glacial flour and are filled up directly from precipitation or (I suspect) from the glacial-tainted lakes when water seeps through the ground (filtering the glacial flour out of the water) and into the lake. We couldn't take enough photos from the top of Skierfe! 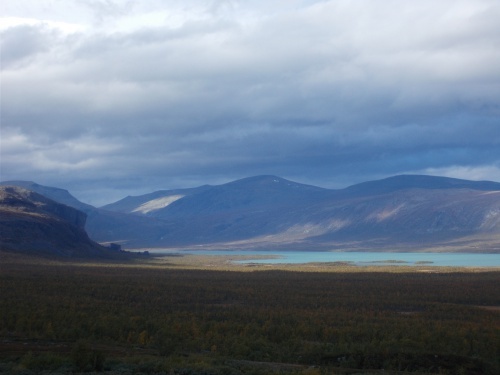 These are the distant glaciers giving the turquoise-colored lakes their color. That's enough photos from Skierfe. Time to get down! Watch out for rock monsters! Unfortunately, the "eyes" of this monster don't really pop out of the photo because they blend in with the background rocks so well. It looked a lot better in person when everything was 3D and the rocks that make the eyes on top of the head are much more obvious because they're a lot closer than the background. You can't really see it in this photo because it's barely even a dot, but there's a boat rowing across the lake! Rainbow on the trail! It's faint, but it's there! Karolina points out where she thinks the motorboat will pick us up tomorrow morning. Our ride wouldn't come until morning, but we made it to the "boat place!" 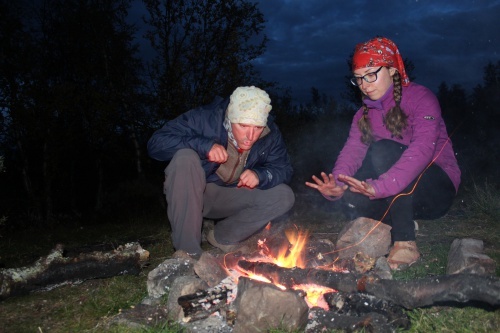 Karolina builds us a campfire!